Death Shuttle by Dan Streib, Sci Fi. Book is in good condition, all pages intact. 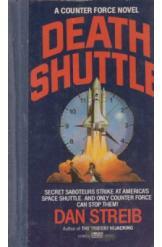 Terrorists have planted a bomb on an American space shuttle. Steve Crown and his US Counter Force unit must prevent the destruction, and in the process discover a dictator thought long-dead behind the plot. Part of the Counterforce series.